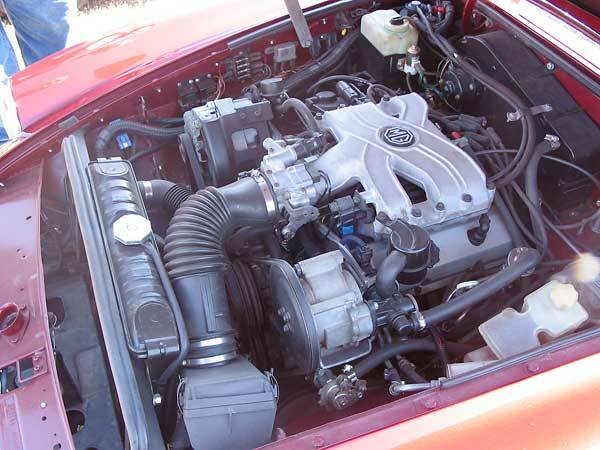 Intake: The engine and transmission came complete from a 1985 Camaro donor car... the intake is the factory fuel injection system including intake manifold, electronic controls, wire harness, emission controls, etc. 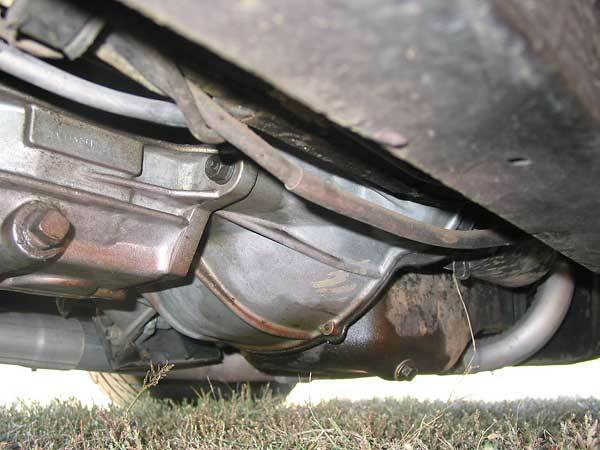 Exhaust: Fabricated manifolds and 2.25" exhaust, with catalytic converter and muffler. Cooling: Dodge Dart 318 V8 radiator was purchased new from Performance Radiator (part number 377). The radiator was installed tilted back from vertical, which has the effect of increasing core thickness somewhat, plus it allowed a taller radiator to be fitted. A welded-in steel structure (1" x 1" box tube) along the top tank reinforces the chassis and supports the hood seal. 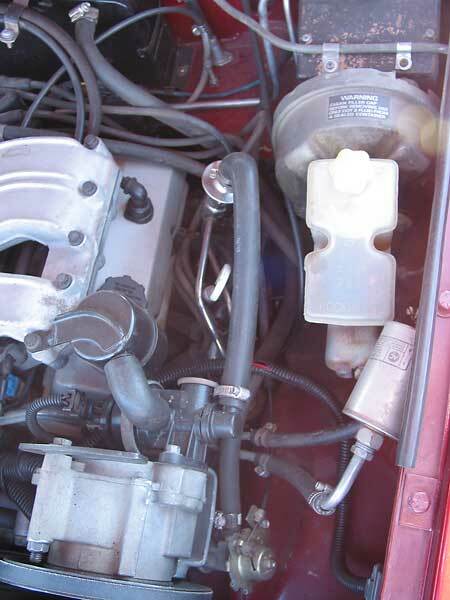 (The seal blocks bypassing of air around the radiator and recirculation of heated air...) A second welded-in steel structure (1" x 2" box tube) along the the bottom tank helps to protect the radiator, supports ductwork from the gravel pan, and serves as a convenient jack-point at the front of the car. A 16" electric fan is controlled by the engine ECM; it's mounted on the engine-side of the radiator. Transmission: Borg Warner T5 five speed. Fabricated mounting crossmember. Fabricated driveshaft. Note: the shifter is a B&M performance unit for a Mustang (ordered from "Jegs"). Modifications were actually easier with the Mustang configuration than a Camaro shifter. The Camaro shifter is much longer and has kick over that is hard to overcome. The Mustang shifter is shorter and straight forward although you must re-drill the mounting pad to fit the Camaro transmission's bolt pattern. The shifter is outstanding - better than the original MG! - my other cars don't shift this nice. Clutch: 10" LuK clutch. Stock MG Slave cylinder with a fabricated bracket to morph into the Camaro slave position. The more difficult modification was to make clearance for the slave on the left side of the tunnel. A pie-shaped wedge was cut into the floor from the leading edge of the tunnel back about 12 to 15 inches. Then a corresponding 6 to 8 inch wedge up the face of the firewall from the floor. The tunnel panel was then formed-over to meet the floor and firewall, welding the seams. Modification to the throttle was then required on the inside for clearance. The clutch pedal has a very nice linear actuation with full disengagement. Front Susp. : MGB, lowered 2". New kingpin bushings. Urethane A-arm bushings. Front crossmember modified for engine clearance. Rear Susp. : MGB, lowered 2". Urethane spring bushings. 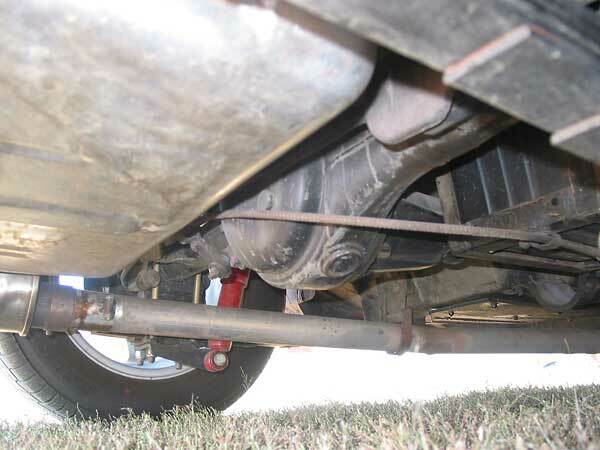 Telescoping shocks (Gabriel "Red Rider" shocks, sized for a Dodge Colt). Fabricated Panhard rod. Brakes: MGB master cylinder. MGB front disc brakes with racing pads. 1979 Dodge Challenger rear disc brakes. Brake bias came out excellent - without requiring a limiting valve! The emergancy brake works too. 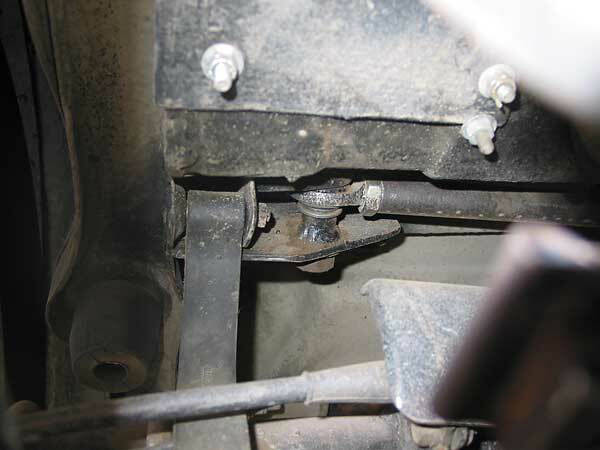 I re-used the pivot fulcrum from the MGB by welding it to the Dodge Challenger axle in the same relative location. The cable from the hand lever to the fulcrum is stock MG. I fabricated 3/16 aircraft control cable from the fulcrum to the e-brake points on the calipers. Wheels/Tires: 215/60/R15 Falken tires on 15x7 alloy rims (front). 225/60/R15 Falken tires on 15x7 alloy rims (rear). Note: wheel offsets were selected to center the wheels within the modified/flared wheel arches. Electrical: Factory MGB gauges. Halogen headlights. No radio. 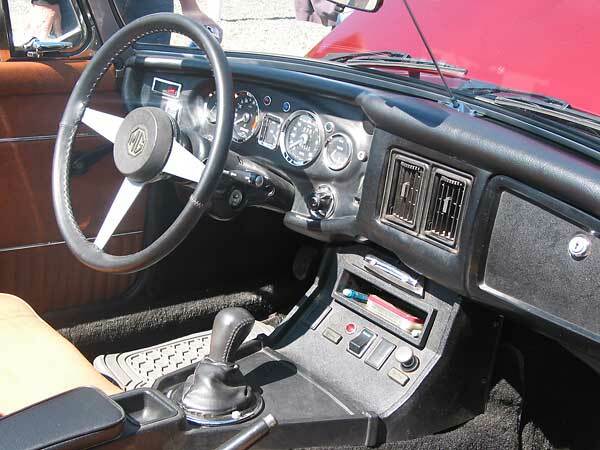 Note: to make the original MGB tachometer work with the V6 engine, I spliced a potentiometer in parallel with one of the resistance circuits in the tach, and tweaked the pot while connected to a 6 cylinder tuning tach until I got them synchronized. Body: Rubber-bumper to chrome bumper conversion. Removed body-side trim and badges. Wheel openings flared front and rear for approximately 3" of additional clearance. 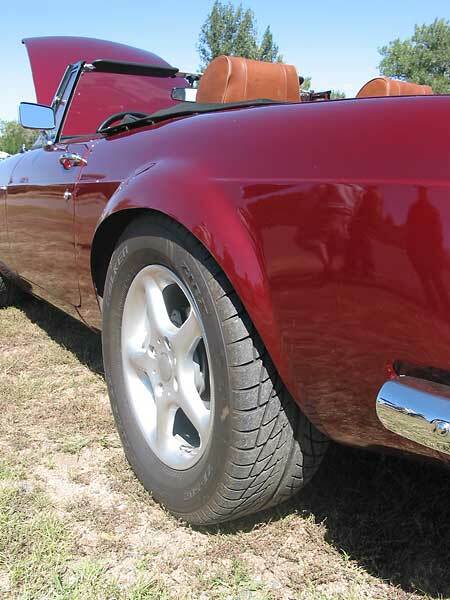 The early Huffaker style fender flares came from Lilves Racing and were made for MGB. They're fiberglass and were designed to be pop riveted on after relieving the openings. I took it a couple of steps further by jogging the sheet metal, letting the flares into the panels, then blending it all together with a commercial urethane auto-body adhesive. Paint: Valspar "Patriot Red Pearl" two stage. The color is from a 2004 Mitsubishi Eclipse, but the tone/color is the same as the original MG Maroon, and the firewall and aprons are still the original factory paint. I did the body work and paint myself. Performance: Considerably quicker than the 4 cylinder, plus it gets 31 MPG! Completed: 2000 (with subsequent modifications). 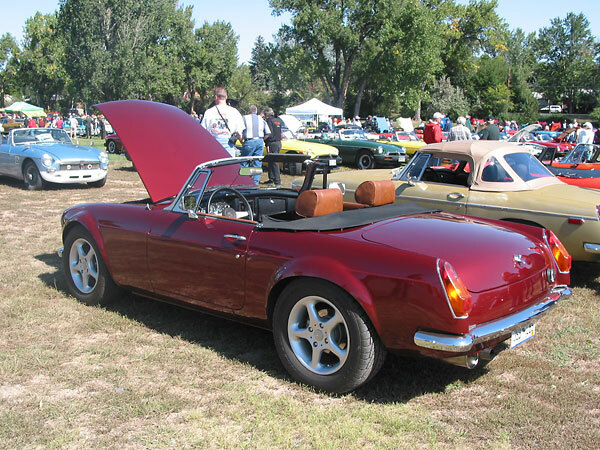 Miles driven: Approximately 5000 as of the Colorado English Motoring Conclave, September 2006. Comments: It takes time! This was not my first conversion, yet it still required far more time than I anticipated. I see there are kits out there now that weren't available when I did this one. Probably money well spent if they fulfill the needs of your conversion. One of my fuss points was to have everything fit under the stock MGB hood without a scoop. 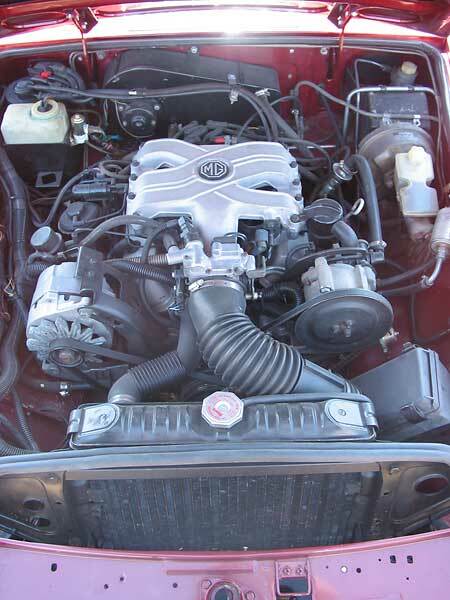 Some of the kits don't accomplish this or require an MGC hood. The MG badge fools the kids at the emissions test station. Strong upper radiator support doubles as a Monte Carlo bar. This car is more environmentally-friendly than any stock MGB. B&M Shifter for a Mustang... modified to fit the Chevy transmission's bolt pattern. 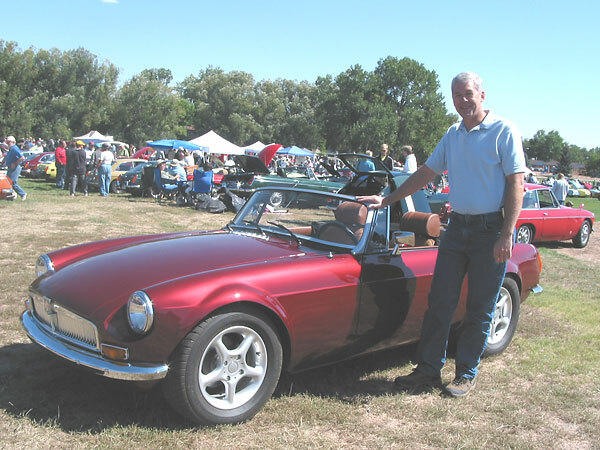 At "The Colorado English Motoring Conclave", September 2006. Modified front crossmember and radiator guard/ductwork. 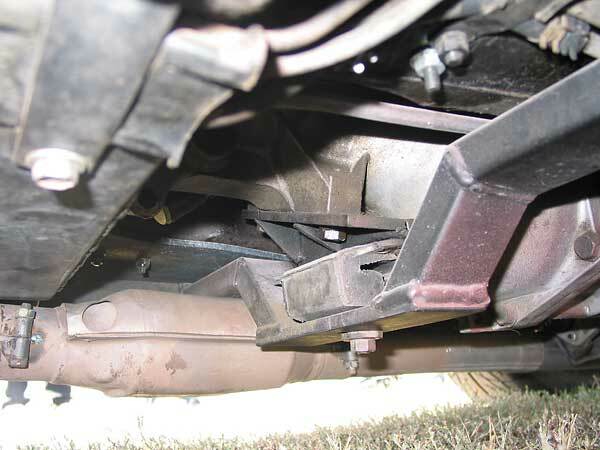 Transmission mount (foreground) and catalytic convertor (background). 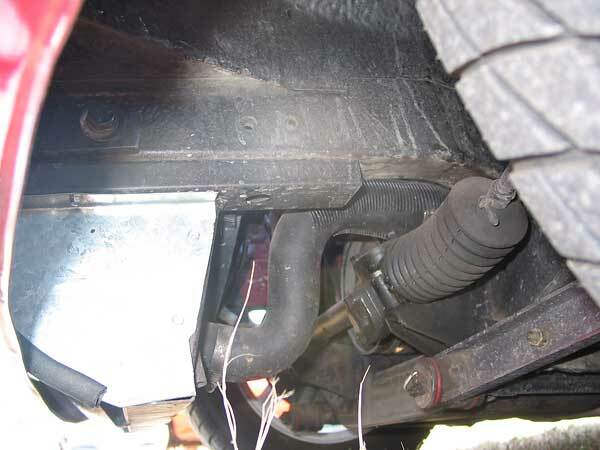 Dodge Challenger / Plymouth Sapparo rear axle. Strong, simple, lightweight body-mount for the Panhard rod. 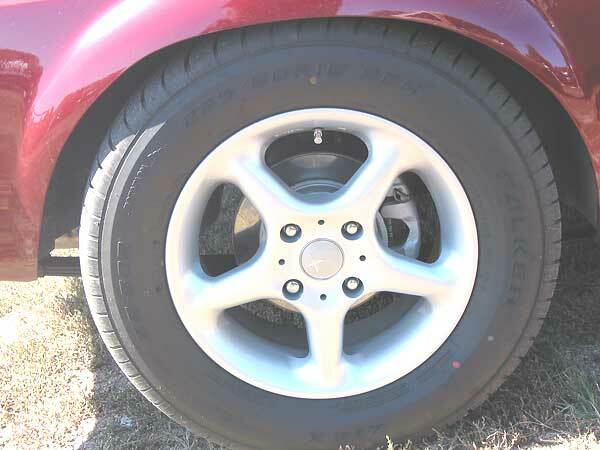 Fender flares provide three inches of extra tire clearance. 15 x 7 alloy wheels and Dodge Challenger / Plymouth Sapparo disc brakes.